See this 2007 story as an animated flash video or on Vimeo. 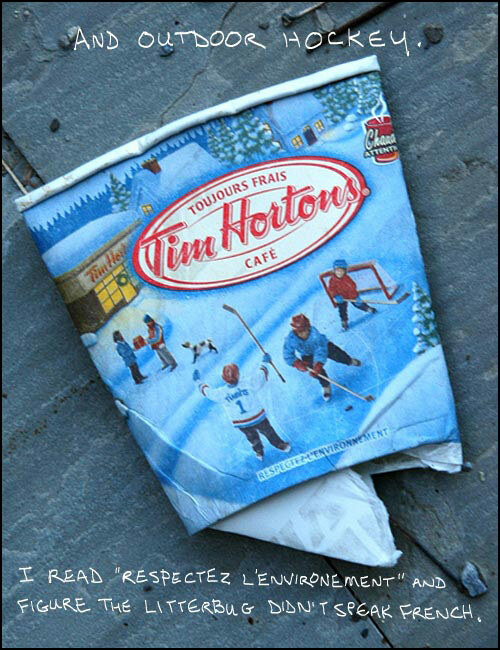 Tim Hortons is a registered trademark of The TDL Marks Corporation and is used under license by The TDL Group Corp. It is absolutely delicious! De-loverly! You have captured the essence of the “knot” of you, I , the individual, society, and global warming. I loved your essay – it had a serious message, but it wasn’t overwhelming. In a world that often tunes out repeated serious messages, your playful way of getting the message across was unique and captivating. Really enjoyed it! 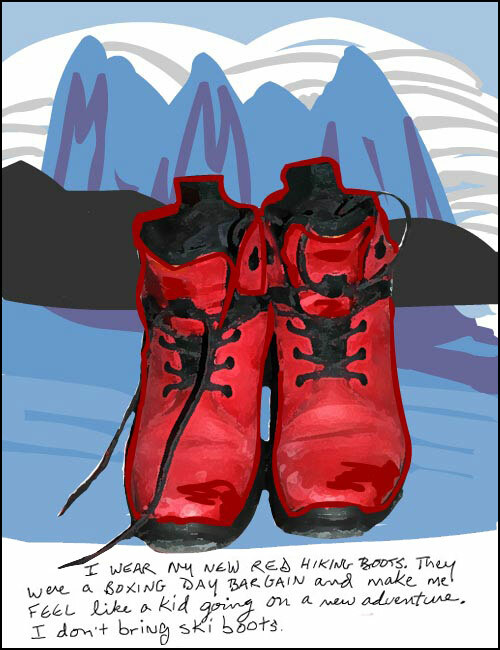 And I loved the drawing of the red hiking boots. I want that on my wall! Really great. It is so difficult – enjoying the warmth but worrying about what’s to come. You have summed up eloquently the dilemma we all face. It is a poignant microcosm. Sad yet inspiring and beautifully presented. That was great. Besides the career and personal relevance of this article being an environmentalist born and raised in Canada, I am reading this in amazement as I am experiencing something so different right now. I am working remotely this winter from southern California for personal reasons. As you probably know, Los Angeles is known for its perfect weather all year round. I am sitting on the couch right now at 8:30 am in knitted slippers, 2 layers of sweatpants, 2 sweatshirts and a fleece blanket on my lap. My hands are freezing as I can’t have them covered as I type. It snowed in Malibu yesterday. Roads have been closed into LA for the past week due to snow and ice. From my car driving around Newport Beach, CA (think The O.C. on the Fox Network) I can see snow. I can see my breath as I breathe. Light heartedly I would ask southern Ontario to give southern California its weather back. Give it back. Please. About 1 billion dollars worth of crops have been destroyed down here (maybe rivaling the helpless ski resorts up there). I understand the dilemma of appreciating some things climate change is bringing to Canada (as the children in Malibu appreciate the snow they are playing with as I type), but people need to wake up now to see it’s not all fun and games. 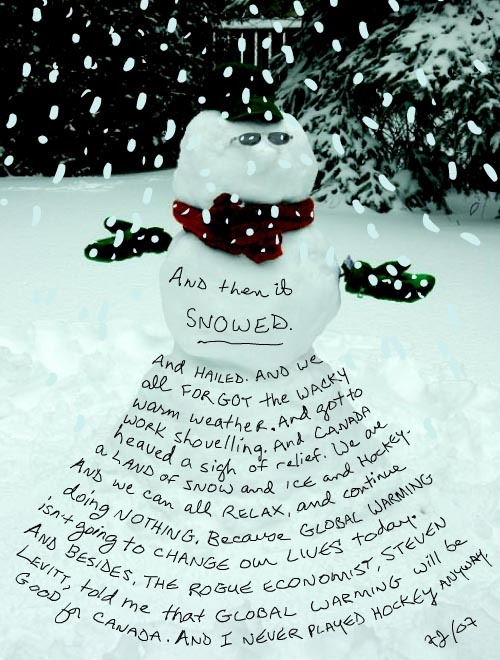 Your Green Winter cartoon story is RIGHT ON. Good medicine! First, climate change presentations must be kid friendly. It’s their future. We have enough science already. Our intuition tells us how bad this is. As with any campaign, Job 1 is ‘Talk It Up’. Funny weather Weird winter etc, etc, etc……. + Be Passionate. The medium is the message. We are the medium. Levitt has it right, after all Canada is a Polar country with a lot of bi-polar people,.. especially those worried about “impending doom” due to climate change. Global warming started 15,000 years ago when Canada then,… looked like Greenland today. The ice above Calgary, Winnipeg, Ottawa and Montreal was a mile thick. We would all be simply a “greasy smear” on the bedrock surface if those conditions existed today. I think Canada should change our Thanksgiving Holiday (which is a copy of the American holiday) to “Warming Appreciation Day” and the citizenry celebrate the climate change that makes our country more habitable and productive. Thanks for the visual journey, very enjoyable and flowing. Of all the time periods to be alive, I believe that this is the one with the most changes on many levels. Things that used to “stay the same” are now changing before our eyes. My family came out here to Vancouver for Christmas this year, mentioning that they came from balmy Toronto temperatures where kids were skateboarding, and jogging. Our temperatures had dropped “unseasonably” out here. 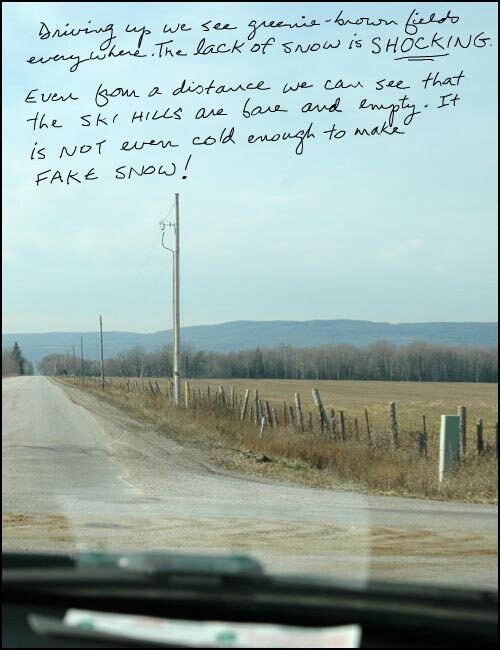 As I looked at the Canadian temperatures during the weather report, I saw Toronto and Montreal basking in spring weather and I was reminded of the letter from ages ago of friend who used to live in Montreal. He had said something to the effect of, “It doesn’t matter what you wear on your head during the winter, as long as you’re warm that’s all that matters.” and he may have sent a picture of him wearing a funny knitted hat or something odd. Now, Montreal you can walk around with no head coverings in the middle of winter. Like our individual lives… sometimes the message has to get louder in order for us to make a change in our lives, and the planet is getting a big message to learn from as well. Thanks for the thought provoking essay. Global Warming has been with us for sometime now, and the more you can stimulate serious interest and concern through your work the better for us all. I only hope it is not too late to reverse the damage already done to our planet. It is necessary we keep this serious matter before us at all times and work toward a solution. We all created the condition now we must all try to work toward a solution. Your Artistic endeavors may enable you to do your part by producing such articles as the one we just reviewed. Congratulations. Let your imagination hit the ceiling bringing forth new ideas. Great! I really enjoyed it. It was a beautiful photo-essay. Stunning imagery. Great work! The price of avocados has tripled here in San Francisco! 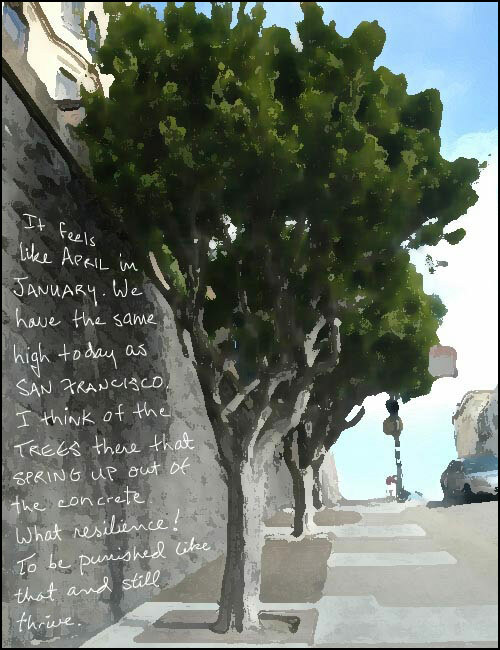 Franke – a wonderful and poignant story for one who grew up happily in the snows of Alberta’s mountains and now, living in the Bay Area of California, misses a real winter. 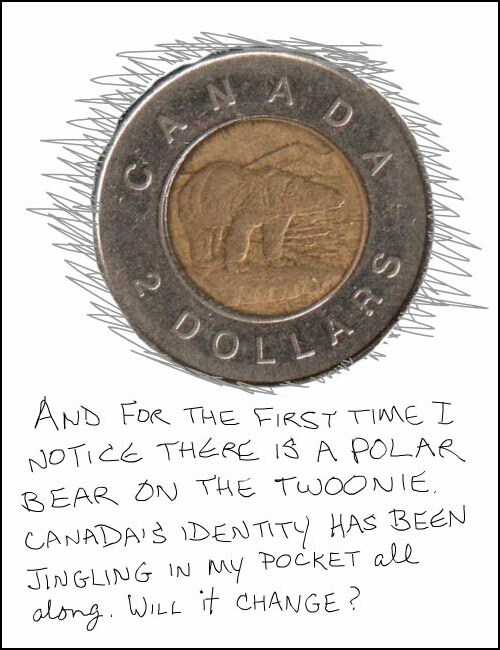 An evocative rumination on something that is part of the essence of being a Canadian, which can be seen from a new angle once one has moved away. Many of us love the beauty of snow and the games of winter weather, but who doesn’t tire quickly of the drive to work in ice and sleet side of the season? 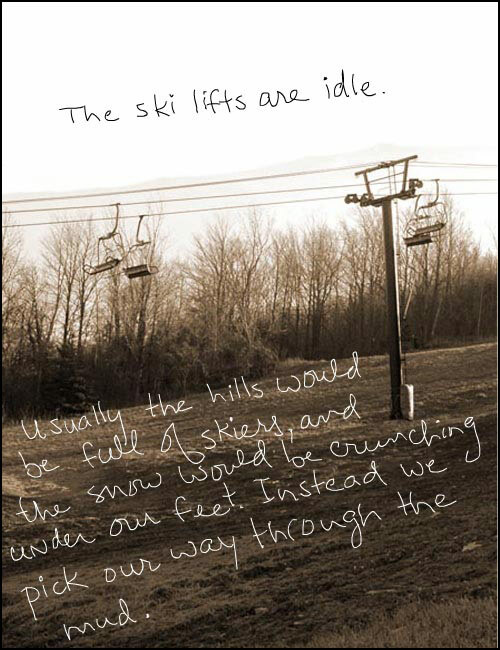 It seems we love snow, but want to love it on our own terms. And this year, the old Mother Nature has pulled a fast one – as mentioned above, California has had its lemons, oranges and avocados frozen to a fare-thee-well this year. The so-called global warming is creating a lot of hardship amongst small and large fruit farmers. The weather it is a changing, but it is not clear which way the wind will blow. Remember to send us some pineapples from the soon-to-appear orchards of the Don River Valley, if this year’s change becomes a pattern. George Monbiot’s HEAT and Tim Flannery’s THE WEATHERMAKERS are sitting in my To Read pile and I find myself reluctant to tackle what I know I must read. It was such a relief to see your essay and actually enjoy reading/seeing such a complex issue made close and personal. This is so beautiful. My eyes are leaky. I’m entertained greatly and smile as I wonder how that bear’s sleepy time is going. I’m sad because I want to be cold, I want to complain of a sore back and cramped feet from my ill fitting ski boots.We were told by some great people that this was our children’s future but I didn’t listen. You’ve got my attention now. Did you know that it has been so warm lately that settlements in Greenland that have been frozen for eight centuries are starting to be uncovered? Imagine if the warming gets worse. Will we be back in the cycle to 11th century weather? Global Warming is a very complex problem — but one solution is for the world community to lobby China and India to stop burning dirty coal, and emitting methane from rice paddies. Canada should raise the price of gas to $2.00 a litre and give a corresponding tax break to people who earn less than $30,000. If Canada follows the Kyoto Accord we’ll just be shipping jobs over to China — and they’ll have no problem burning more coal. I live in Alberta where there’s record snowfall and CO2 emissions. And severely sub-zero weather. 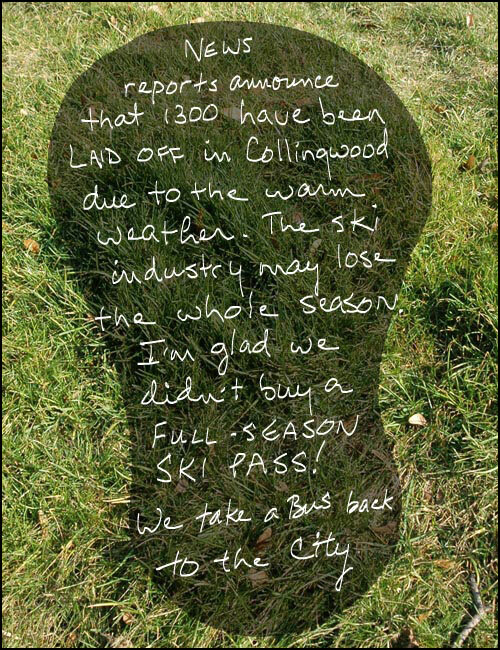 Here we are talking about how the lack of snow in Collingwood might actually wake “some of them” up. Hmmn. And yet our glaciers weep as they recede. 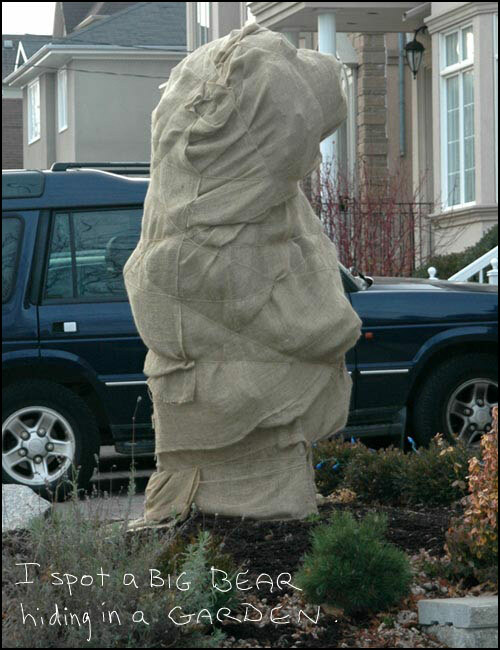 In Europe, they care enough for glaciers that some wear blankets in summer to keep the snow for next year. In Europe, they have smaller cars, lights on timers, EXPENSIVE fuel and novel energy reclamation initiatives. Canada’s identity is as much about VASTNESS and untapped potential as it is about Snow and Hockey. Does this perception keep us from actually seeing? Doing? Differently? Evocative piece. Thank you for sharing your piece of mind. 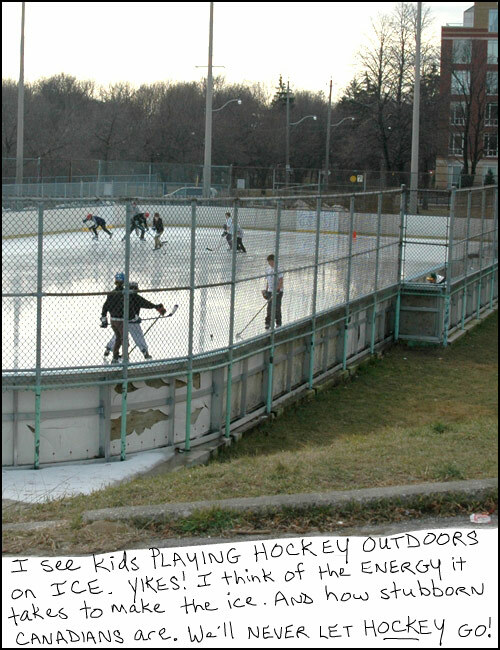 True but the cold keeps the riff raff out of here. You know, among other things, I’ve kind of gotten used to a “riding season” for motorcycling in Canada. It keeps me hungry for the dog days and greatful for the cool crisp relief of Winter. That and the many other activities and distractions that come and go with the seasons are what this Country is all about. It occurs to me that the checks and balances of the climate that we live in, or lived in, should I say, is what keeps us all even keeled, well rounded, engaged individuals. Change truly is good. I loved the essay and in particular the gentle way it hammers the point home. Franke – as much as I thoroughly enjoy your contribution to the world of Office Politics, you have paradoxically presented a very sensitive topic in a very real and even humorous light. You nailed the “elephant in the room” aspect and the impacts that are already being felt, but you put such a delightfully human spin to it. Very well done!!! 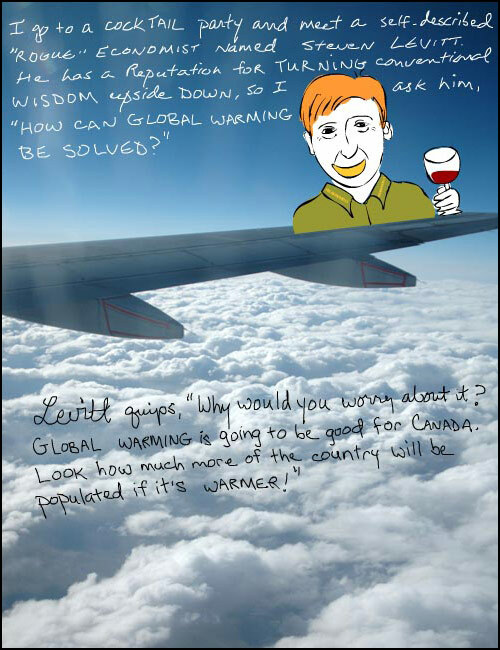 Being a “global warming agnostic” I enjoyed it. Well done! 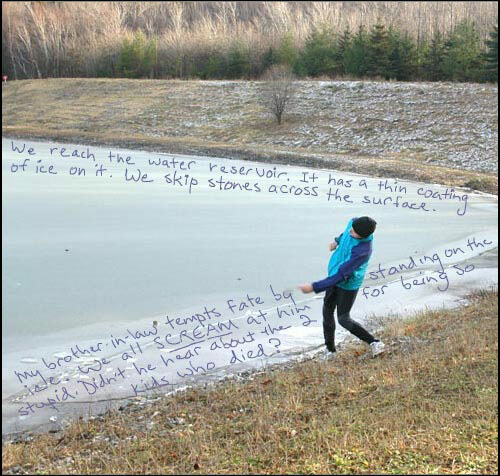 Your Green Winter story is just phenomenal. Thank you for writing it. What a fun way to get our attention! It is time for all of us to determine how we can make a difference. Thank you. Thanks to this, I have decided to buy a Prius or Honda Civic instead of an Audi. Great presentation. Franke, what a creative, engrossing way to bring attention to this serious problem. Because I spend a lot of time online I believe that the world had gotten smaller. That mediators in Barbados, Chile and Germany are my neighbors. But I hadn’t realize how closely my fate is tied to those even closer to me. For example, this morning I learned that because of the droughts and storms in the Mid-west, farmers in Missouri can’t feed their cattle or must pay exhorbitant prices for hay. That Florida growers lost an entire crop to frost along with their revenues for the year. It’s getting clearer to me, and hopefully, to others that global warming isn’t a hoax or a future concern that we can resolve at our leisure. No, global warming isn’t good for any economy or any human. I loved it. What a wonderful way to capture all the issues we think about and often too easily dismiss. Verrrrry cool and very disturbing. I’m already in the middle of shopping for a hybrid after seeing Gore’s movie. Thanks for the work you do. Franke, still thinking about your question … what will the environment be like in 20 years? My response about the speed and severity of onset of climate change (and environmental degradation more broadly), is based on a couple of thoughts on social psychology and mass movements. Do you remember the film “If you love this planet” by Helen Caldicott (1982)? With the Cold War still running “hot” (a different form of global warming), it was the cause de jour. A parallel with Gore’s recent movie? While people are forced to think about global warming when winter is delayed unnaturally, month-to-month or year-to-year variations are not unheard of over the past century. Even though the trend is not favourable (i.e., creeping global warming) my concern is that people will forget about environmental conditions when it doesn’t directly impinge on their lives. Despite all the public debate and outrage and protests of the 80’s (and earlier), have we eliminated nuclear arms? Definitely not. Indeed, the “doomsday” clock was recently moved 2 minutes closer to midnight. So what will the environment be like in 2027? Well, I hope Mother Nature gives us a firmer and clearer kick in our collective butts. Not enough to wreak global chaos (like nuclear warfare), but enough to give society the firm and lasting resolve to make meaningful changes throughout the economic system – to minimize all human environmental impacts. My 2 cents for this morning. I enjoyed your essay, you captured the quandary of global warming with a child-like sense of wonder and some beautiful visuals. I was told that Vladimir Putin has made the same response to concerns about global warming as Levitt did. Living in Northern BC now, I’m not so sure that warmer is better. At the moment I am in the Okanagan where we are having an ‘epic’ winter for snow and I am remembering how much a part of being Canadian the snow is. I even got out skiing for the first time in 15 years. So, I’m not keen to have it warm up… In the category of mixed blessings — Apparently snowmobiles produce about 200 times the pollutants that automobiles do, on a per unit basis.? Thus if we have a green winter we are actually reducing green house gas emissions by keeping snowmobiles from operating. There are also problems with the warmer weather. In Northern BC it has been years I am told since there was a sufficiently long cold snap (minus 30) to control the pine beetle population. The result is that 75% of the pine forest is infested and doomed. That is the scary downside of global warming. Thank you for such a lovely, creative and honest presentation on such a difficult, heartbreaking issue. I will introduce your page to my friends! Blogged: I accidentally had some coffee spilled on me this morning on the bus, and that led to a friendly conversation, and that led to … Franke James and her visual essay “A Green Winter: Will Global Warming be Good for Canada?” Her creation intimately brings in art, personal experience, and creativity to a complicated issue, helping to draw people in and relate to it. When many find it easy (or at least, less uncomfortable) to shy away from the complicated issues of global warming and how it will affect our environment and lives – and how we can affect global warming – Franke not only addresses, but embraces this complexity in a beautiful way. For me personally, experiencing the visual essay made something tick inside that said travel.. explore.. live.. enjoy. We are reminded of the beauty of nature, of life essentially — and the urgency to save it from being destroyed and lost. Aside from the overwhelming beauty around us, A Green Winter addresses the human struggle of responsibility vs. the comfort of convincing ourselves that we are doing our part, while everyone is a culprit but us. This really made me think about how much our lifestyles and lives are intertwined with, and dependent on, the environment; and while this may explain the resistance to change (people want their lifestyles to remain the same), it also shows how important and crucial and urgent it is to act now before everything changes very very drastically for the worse. 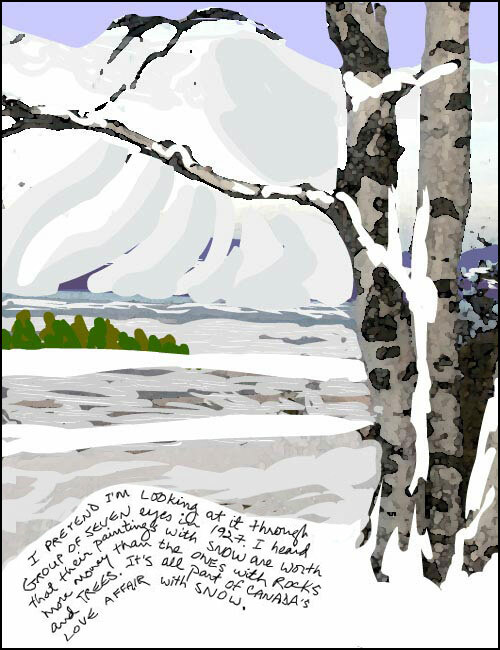 Blogged: A Green Winter: Climate Change and the Canadian Identity: A quietly brilliant and poignant visual essay from my friend, Franke James, musing on the nature of Canadian identity, and our future in a climatically changed environment. Fun to see the article in the Toronto Star about your Green Winter essay. Congrats! Keep up the great work! 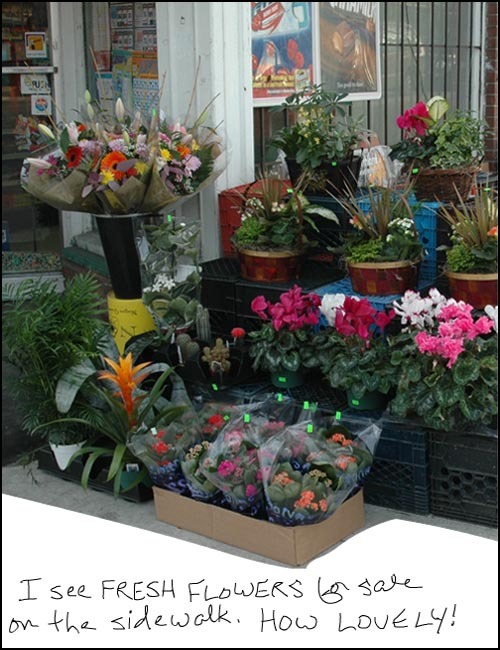 Hi Franke – saw the article in the Toronto Star this morning – good for you! That photo essay is so dead-on right about the ambivalence we are all feeling about this weather and it is nice to see that recognized in a forum that has such a large circulation. Yay you! Next – a book? You know I loved it!!!! Now, you’ve got our attention. What’s next? You are on a roll. An incredible article in the Toronto Star! It is so exciting that your deepest concerns found the medium of expression which enabled your concerns to touch such a mass of people! The idea that more of Canada will be habitable and arable if and when the climate warms up is misleading. 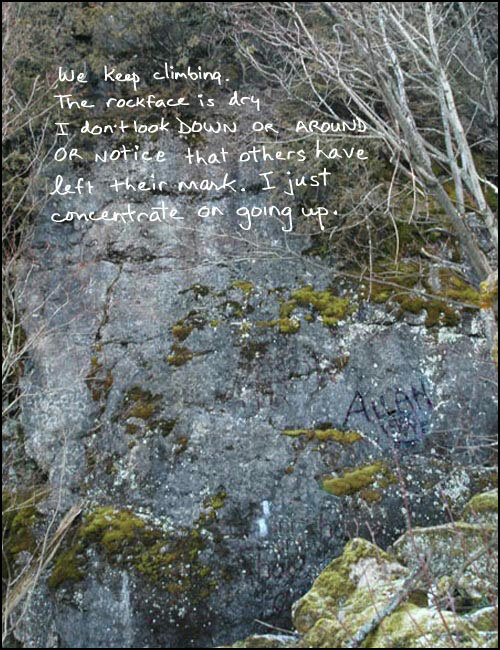 ( a la Mr. Levitt) From Ontario and Quebec all the way to BC, the farther north you go, the more rocky and unfertile the terrain. 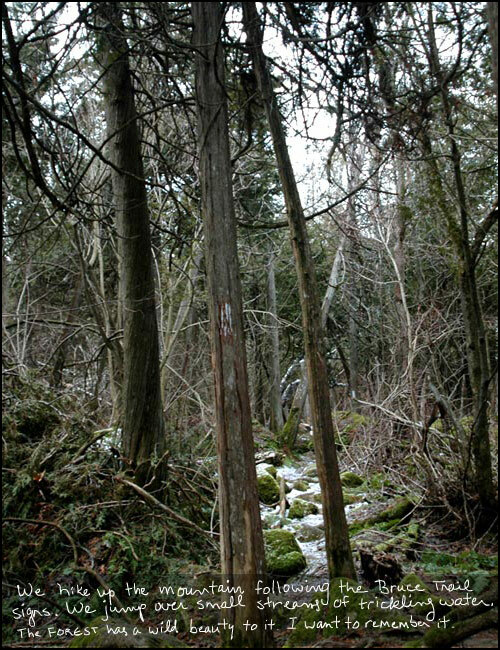 Once the trees burn off in forest fires, The Canadian shield will just be a rocky desert. Nicely done – and nicely wry. 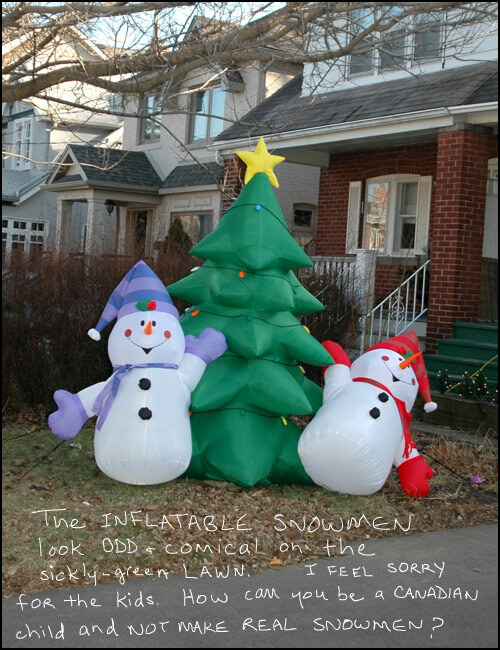 I share the Canadian relief that winter has come – not because of hockey – but because it is our discernible, national form of suffering. And it is a tidier form of suffering than other parts of the world experience. The thought that all this was going to slip to BC was not to be countenanced. Icicles and shivering squirrels forever! 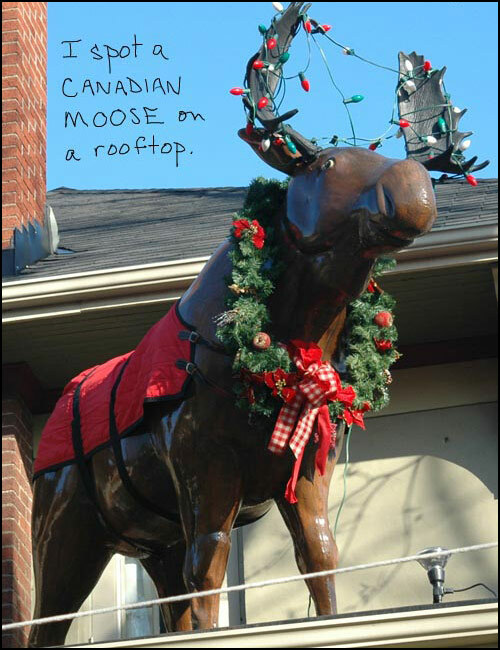 Blogged on Treehugger: WILL GLOBAL WARMING BE GOOD FOR CANADA? 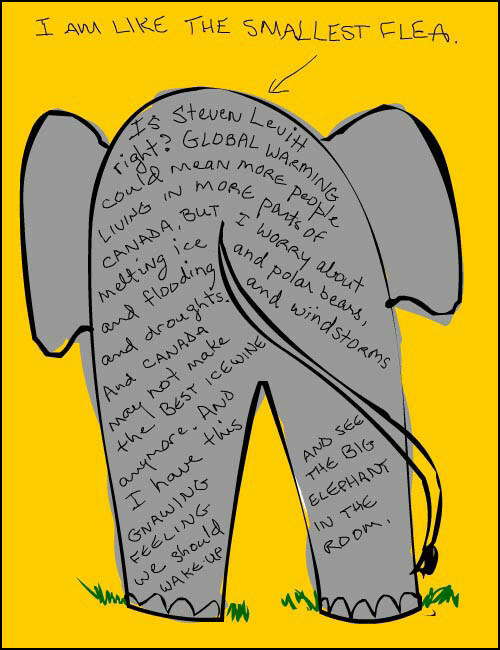 Toronto artist/ ad exec Franke James asked Freakonomics author Steven Levitt about Global warming and he responded “Why worry about it? 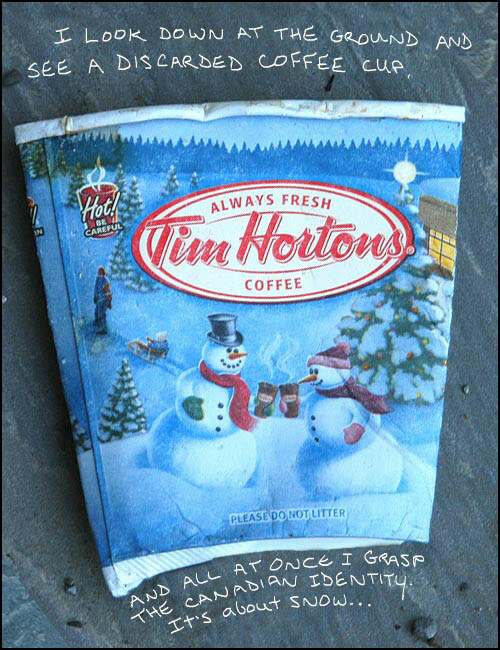 Global warming is going to be good for Canada. 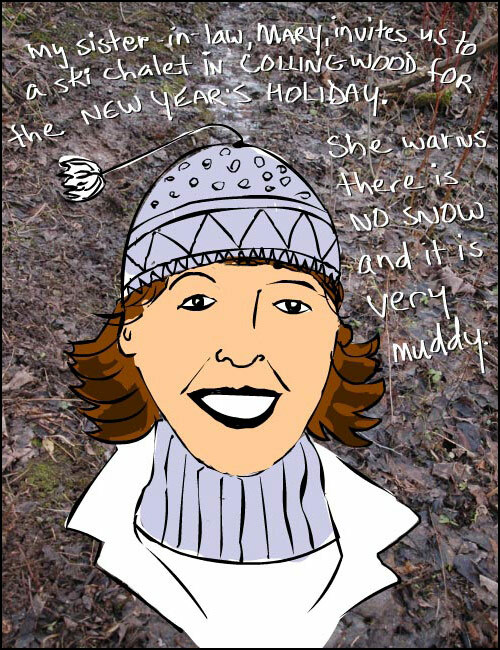 Look how much more of the country will be populated if it’s warmer!” She is dumbfounded, and after a trip north to ski country for New Years she put together a collection of photographs and drawings with handwritten notes that tell the story of the shock of New Years without snow. Called A Green Winter: Will Global Warming Be Good For Canada? It has been very popular and is even going into a new university textbook. “It’s different. It’s powerful. It’s contemporary,” said Kim Blank, a professor of English literature and cultural studies at the University of Victoria to the Star. It is effective, an emotional reaction to the physical problem of a changing country. Really what a delicious work. Also is tremendously brutal. We all as humans act the same. We can be aware of the danger lying ahead, and at the same time we are capable of finding beauty in our mistakes. I congratulate you for this important warning. I hope we all take notice and are united around this emergency, that is already too close to ignore. LETS SAVE MOTHER EARTH, NOW. for our great great grand children. Fantastic! I’m just below the border in Rochester, NY and we had exactly the same weather. I blog about the personal aspects of global warming and this post perfectly sums up my experience this winter. Blogged: In lieu of the recent announcement that yes, man is almost undoubtedly responsible for global warming, I bring you an artists response. Discussions of climate change and environmental degradation often harp on scientific fact and numbers, an absolutely necessary, but often times dry, procedure. I think a much more compelling (especially to our generation) technique is to communicate these problems through art. Perhaps we have short attention spans, perhaps we aren’t critical thinkers, but nonetheless, deep down, most people care about political issues, no matter how nihilistic they may act. Blogged: Franke James has a visual essay on how deep the impact of Global Warming will be for Canada, elaborating on a quote by Steven Levitt (author of Freakonomics) about how “good” it could be. It captures both the frustration of having to deal with the nuisances of changing weather patterns and the disruption they cause to our little traditions; and to live in an apathetic society that will need a LOT MORE than a few warm days to react. This is so good I’m forwarding it to our group’s mailing list, and oh yeah, the prime minister. Will Alberta Melt Hockey? Forever? 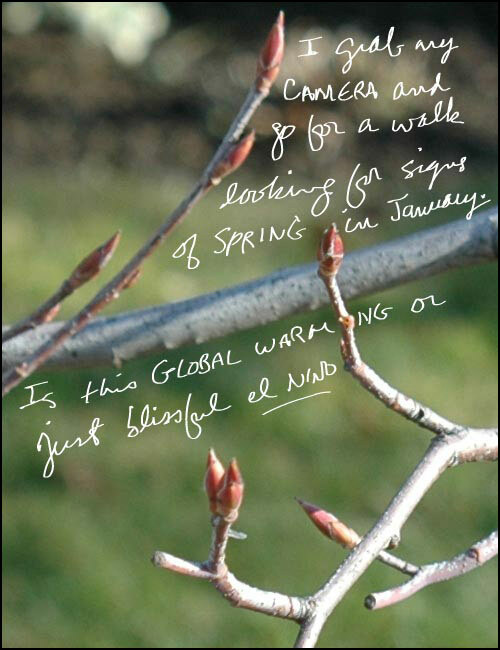 Blogged: EcoSherpa / Franke James’ visual essay is called “A Green Winter: Will Global Warming Be Good For Canada?” and I must say it really put a smile on my face when I read it. As mentioned, I missed the word “visual” in Franke’s email, so I was somewhat taken aback when I found a series of cartoonish images and photos with writing all over them, but the presentation totally sucked me in. I was completely hooked until the very end (can’t remember the last time I said that about an ‘essay’). This morning I came across a terrific post on Eco-Sherpa featuring a tour of NDP leader, Jack Layton’s green house. Check it out. It’s really informative and may inspire you to do a few energy improvements around your house or apartment. I live in London, have two children, and am also deeply worried about global warming. I wanted to thank you for your essay. I feel almost foolish for sharing a simliar sentiment with your “rogue”economist. I do love warm weather and wasn’t fretting the record highs this winter. Thank you for calling to my attention a serious global problem that won’t be solved with people delighting in January’s new found warmth. 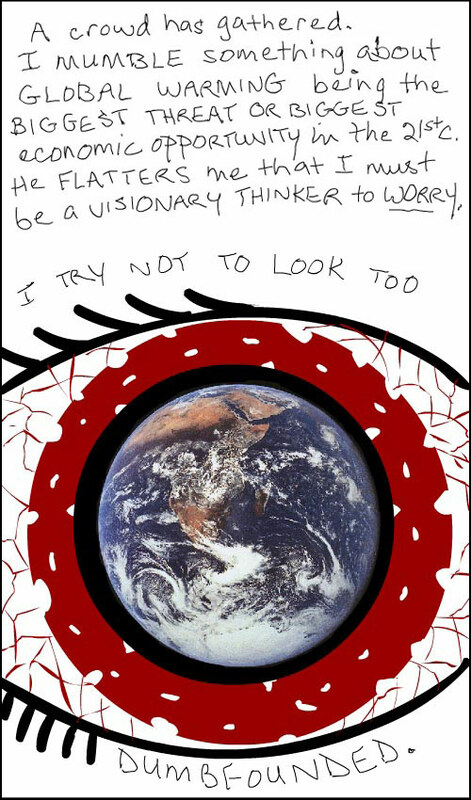 Franke James is to be complimented for this poignant contribution to raising our collective ‘CO2sciousness’! This first decade of the third millennium is just the first one-percent of this brand new era of history, and the first one-tenth of the new 21st century. What will the world look like at the other end of the millennium? At the other end of our century? Or sooner? A short video PSA about ‘Eco-Driving’ — not the hardest thing, and very doable! — can be viewed at Treehugger. On April 16, 2007, we had a foot of snow fall in the Valley. On April 21, 2007, it was 27 degrees in the sun. Global warming is here and it’s real. Great essay, Franke. I really enjoyed reading this post…thanks for sharing your point-of-view! Would love to come back to read some more! Thank you, so beautiful (I can continue…). Ya… I think its right. IT’S TIME TO SAVE OUR LAND!!! Few years later, i think we won’t be able to see at least this type of scenery anymore also… I simply LOVE snow. It is a beautifully presented essay — an eye-opener. The Green winter movie is amazing. Really, really good. In some sense, this narrated slide show/painting show is its own genre. Fantastic! Thanks for dropping by! Your Grandfather, Alex Colville, is one of my favorite artists. 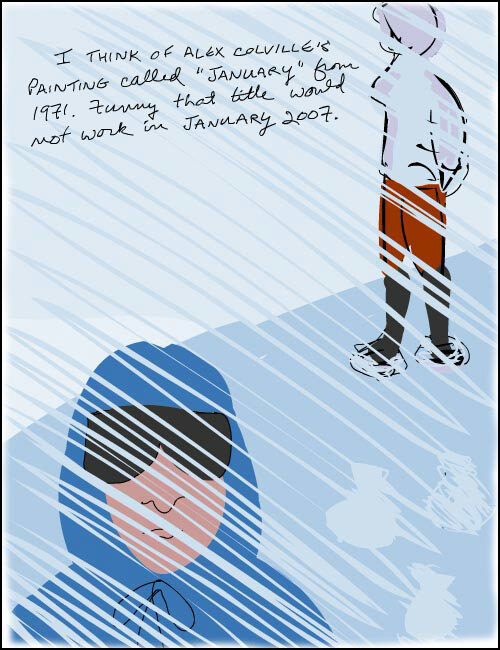 I hope he would approve of my foggy recollection of his great painting! This is a great story, and can only lead to good, when we totally – and we mean “totally” – reject our current lifestyle. Thank you. Another one I just discovered. Very very nice story Franke. Despite being French and not anymore used to listening to English, I understood all the texts read by your soft voice. I’m also reading this a few years on. Edouard, j’espère qu’il y aura une version française de ses oeuvres pour diffusion ici au Québec et dans tous les pays francophones. In the meantime, we had an almost snowless winter here in Montréal 2009-2010. 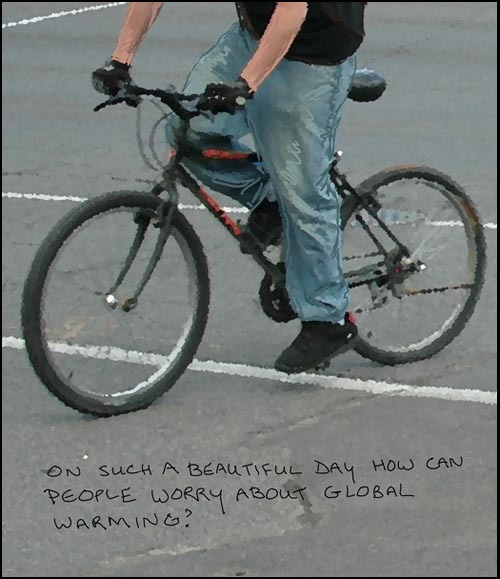 I confess I share the quandry of the environmentalist winter-hater – unlike you I hate snow, don’t ski and love riding my bicycle! I was thrilled to be able to ride it all winter long, but then in the following spring there were severe forest fires in central-northern Québec and the same thing on a far larger scale in Russia. Not to mention the poor polar bears and the problems facing Northern Indigenous communities. 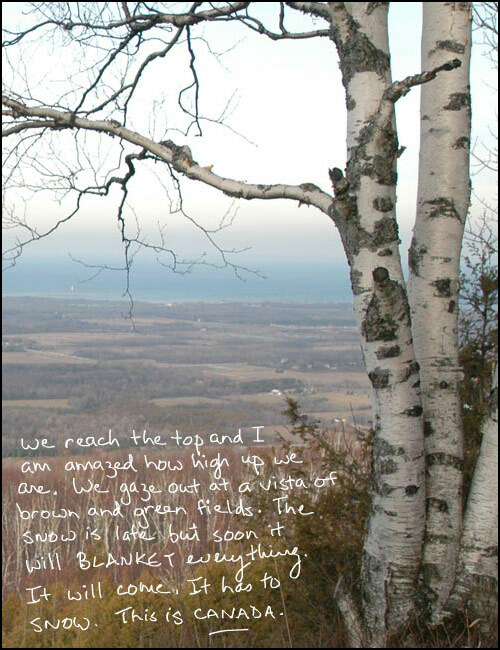 There was somewhat more snow this past winter but there were many jagged freezes and melts; the winter was more like one’s I’ve seen in southern Ontario and among the friends who wrote in here from Buffalo and Rochester. I was out cycling in snowless Mtl streets on New Year’s Day. And overall, global temperatures are rising far faster than predicted.